Bouncing back on Kassatly Chtaura’s “mediocrity of the year”, Malik’s bookshop figured they were legitimate enough to exploit Michael Jackson’s death for their “back to school” campaign. I hate to break it down to you, but adding a fineprint that says “in loving memory of Michael Jackson” doesn’t make it right. But putting aside whatever moral issues might be at hand, Malik’s is actually, as they (rather clumsily) put it on their billboard, an integrant part of university life, both in AUB and LAU. Every book we bought, original or copied, every binded document or photocopy we made was, by definition, Malik’s business. Yes they’ve been here through the fun school days and the rough project overnights, they have. so… how exactly do we move from this to “we like Michael Jackson, so do you, please love us”? 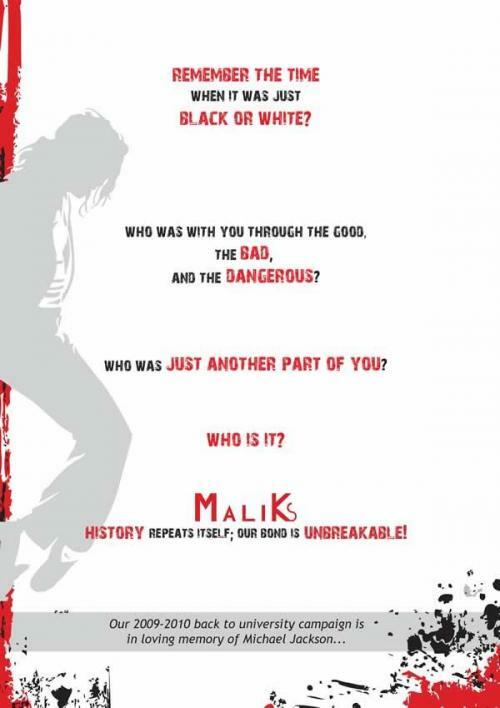 I think Malik’s has more than enough assets to actually establish a powerful, long-lasting brand identity, that indeed could create that “unbreakable bond” with students, but this is definitely not the way to do it. This entry was posted in Advertising, Marketing, Only in Leb and tagged #fail, AUB, back to school, kassatly chtaura, LAU, Malik's bookshop, mediocrity, mickael jackson. Bookmark the permalink. Thanks for giving credit where credit is due!